Recently, we both faced large projects in need of finishing — Virginia, a sweater pattern; me, a pound of roving. There were days when it seemed like neither of us would actually finish. But, even with projects that seem to drag the most, there’s always a possibility of finding that nugget of inspiration to push you through to the end (even if what motivates you is just getting it off the dining room table). 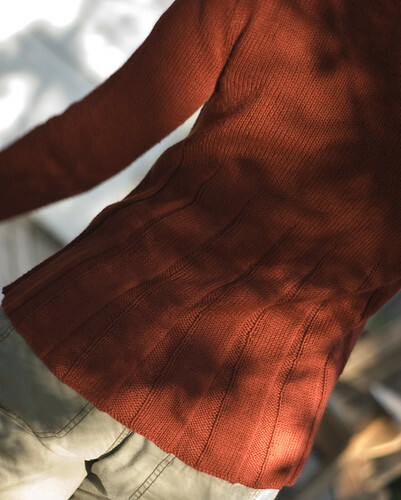 Virginia’s project, a pattern in Berocco #228 called “Nopareil,” was knit with some beautiful Blackstone Tweed. Sometimes projects take on a more generous amount of inertia, making forward progress more of a slush. From what I overheard, this also must have been aided by choices made by the designer, in terms of construction, details and a collar that would not end. Still, all in all a nice sweater. 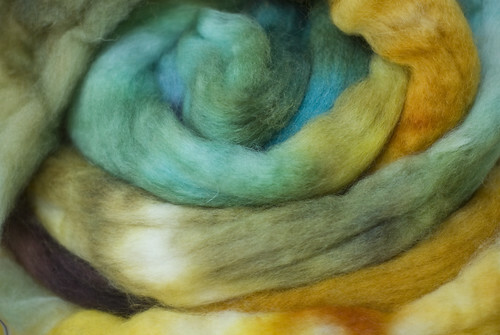 My own project was spinning up a pound of roving. If you have been a regular follower of ScratchCraft you may have noticed a drop in the number of spinning-related projects. I have started to kick things back in to gear, but got a little ahead of myself when deciding to tackle a 16 oz. blend of Pygora, Wool, Mohair and Silk. All told, I spun approximately 1050 yards of 2-ply yarn. 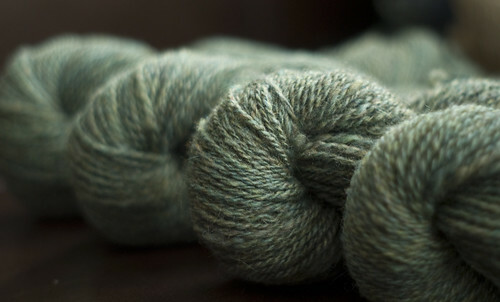 Don’t get me wrong, it’s a lovely fiber making a lovely yarn. But, if you aren’t spinning regularly, 16 oz. can feel like it’s taking forever (must be some sort of fiber equivalent of ADHD). At any rate, it’s done, and I think Virginia already has a sweater idea brewing. My motivation to finish came with the arrival of my installment of fiber from Hello Yarn. This is “Scorch.” I knew that in order to dive into this luscious 4 oz. pile of goodness, I had to free up the spools. And, now I can — tonight, in fact. Virginia wrapped up another cardigan (even before the keyboard was able to cool down from the previous post). 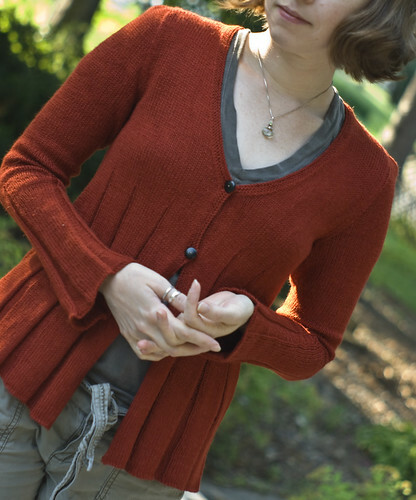 This is “Erin” (from Heartfelt) by Kim Hargreaves, knit using Rowan’s Calmer. Like her, I have my hands clasped in front of me (more over my stomach, really), because as I type this, the aroma of baking apple pie wafts through the air and is making me quite hungry. Yes, it’s that time of year again. Apple pie is a staple around these parts, and will continue to be so since a coworker bestowed upon me several bags of Haralsons from a tree in his yard. I’ve done what I can to make this not so much a treat – instead something that can be eaten as a meal (as breakfast with a cup of coffee is perfect), a dessert or just because. Basically, the apples (about 20 of them) are peeled, cut up and tossed with a handful of chopped dates, spices (cinnamon, nutmeg and cardamom) and some flour (3-4 Tbsp). The crust is about 1/3 cup butter (chilled and diced) pressed into 1.5 cups of flour (I also like to add a dash of cinnamon to the crust) and a sprinkling of water to hold it together when rolling out. Roll the crust so that it is quite a bit bigger than the pie pan used. 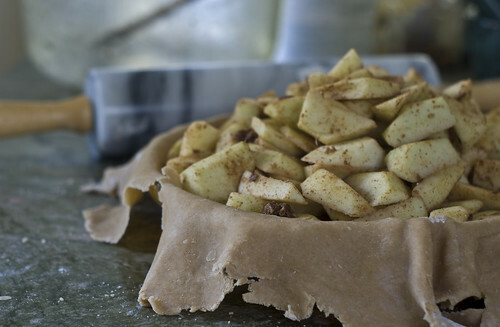 Fill with apple mixture and fold the crust over (like a rustic tart). Bake in a preheated 425º oven for 50 minutes (or until apples are done to your liking). I also like to put a small piece of foil over the opening at the top of the pie to help the apples steam a little. I remove this piece 15 minutes before pie is done baking. There is debate on if apple pie is better eaten cool or warm. 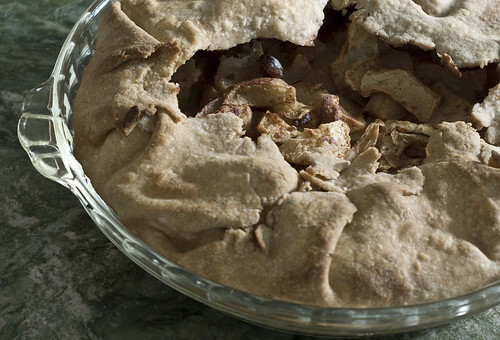 Personally, I like the pie to cool before eating (the apples seem sweeter, and the flavor is more melded). However, if I’ve completely lost my self-control and there is vanilla ice cream in the house… umm, let’s just not go there. After this post, I believe I will have caught up with posting all of Virginia’s scratchcrafty goodness that she’s made over the last couple of months. 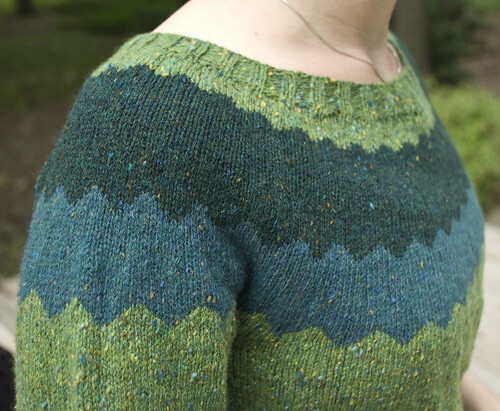 There are three sweaters, two from patterns, and one of her own design. 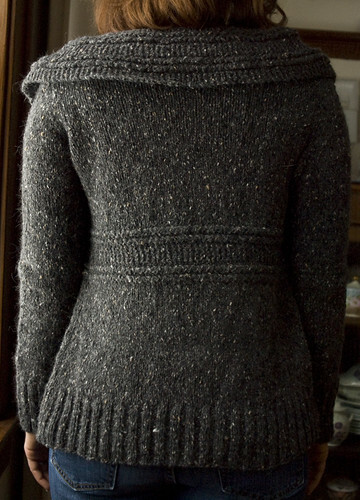 The following sweater was designed by Kristeen Griffin-Grimes for the French Girl Knits book. 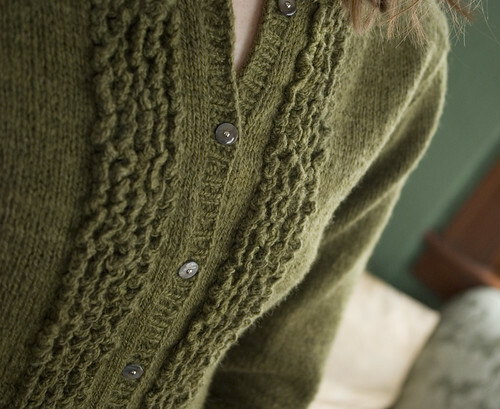 Virginia knit this using Rowan Kid Classic. 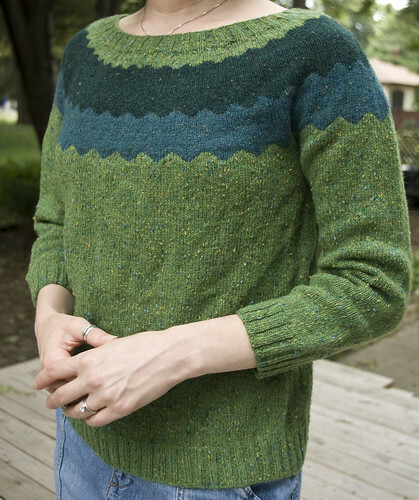 Next, this original sweater was knit using Rowan Yorkshire Tweed yarn. 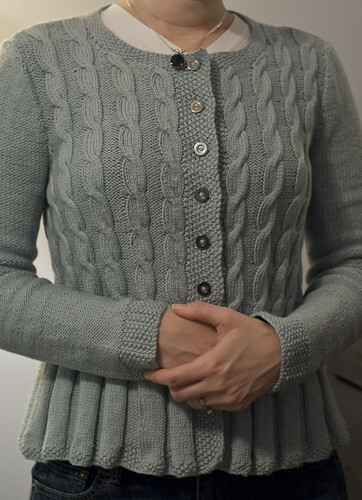 And, hot off the needles, this cardigan, called Muse by Martin Storey (from Rowan Classic Reminiscence), was knit using Classic Elite Soft Linen. I think I’m all caught up, for now. Now that life is beginning to return to normal, the focus of this blog (thank goodness) will return to its original purpose. I hope to post less and less of illness and more and more of all the things we like to make… and, hopefully without cramming so many projects into one post. 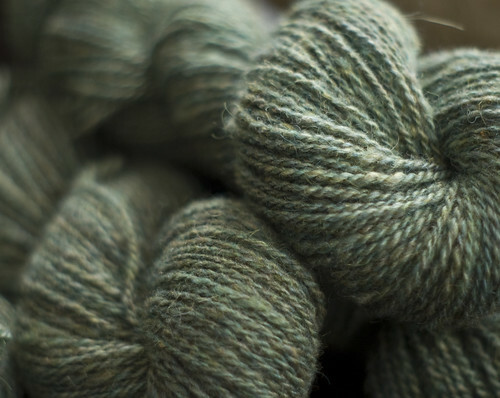 Not only that, but they also use both naturally colored wool and natural dyes for their yarns. Their color palette is quite something. I think Virginia had a tough time picking between the colors that they have. But, this is, in my opinion, a very suitable choice for this sweater. I think she agrees, too.